There were riots in Sucre last weekend with reports suggesting that at least 3 people were killed. The UK Foreign Office had warned of disturbances, but demonstrations can easily occur in Bolivia. I’ve seen pictures of the riots in Sucre and these are on a different scale – especially when you hear that there have been fatalities. Correo del Sur even shows pictures of riot police and tear gas today. So what’s it all about? Well, when President Evo Morales was elected, he promised to reform the constitution to give more rights to indigenous people. As it happens, the draft of the new constitution has two points that are causing unrest in the country, and neither have anything to do with his election promise. The first I have already written about – moving the seat of Government back to Sucre. This would make Sucre the sole capital of Bolivia. The second, and this is what appears to have caused the riots, is that President Morales could be indefinitely re-elected. After introducing a lot of reforms, such as reducing the President’s pay, on first glance this does look like it is going in a new direction. Even if there are other countries where the President can be re-elected as often as they care to stand for office, other limit this and whilst there is probably something to be said for both systems, I am suspicious of someone who wants to change the law in this way for their own benefit. Bolivia has seen enough dictators in it’s past who clung on to power (only to be promptly displaced by a new regime). Even if this law is on a democratic basis, it doesn’t seem to be sending the right message to the people! The UK Foreign Office has advised travellers of disturbances that are expected to take place in La Paz, El Alto and Sucre between the 22nd and 27th of November. Some violence is expected, especially in Sucre. 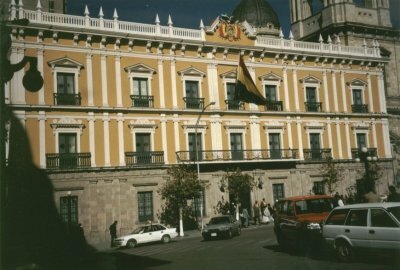 The Congress building in La Paz, where demonstrations are expected. Have you ever wondered where the cars damaged by hurricane Katrina ended up? It’s not something that I can really say that I’ve thought much about, even if I am spending a lot of time thinking about environmentally friendly cars! This report has the answer: they ended up Cochabamba! Despite the cars being classed as total write-offs and the insurance companies paying up, it seems that a lot of those that may normally have been sold for scrap were sent southwards to Bolivia and are now waiting to be repaired. Modifying cars for the Bolivian market is nothing new – I remember seeing cars that had been converted from right-hand to left-hand drive because they were cheaper to import that way. But are these write-offs really going to be safe to drive? For those learning Spanish, there is an excellent podcast called “Notes in Spanish” which offers three levels of difficulty and accompanying worksheets. This episode of the advanced podcast is an interview with a Bolivian lady called Silvia who now lives in Madrid. If you can understand Spanish, take a listen and hear the Bolivian accent as well as a comparison between the Bolivian and Spanish cultures. You are currently browsing the Amigos de Sucre blog archives for November, 2007.